Combining two nine holes scores to form an 18 hole score. Highlight golfer's name and press F9. 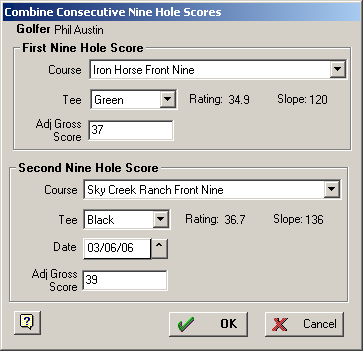 While viewing the golfer's scores, click the Combine Two Nines button, or press F9. Note: This option is valid only when calculating 18 hole handicaps. If you have created a nine hole roster, this option is not available. This window allows you to enter two 9 hole scores to produce an 18 hole score. The USGA says, "Nine-hole scores occur when any two nine-hole rounds are played. The two nine-hole scores are added to create an acceptable score. Nine-hole scores do not have to be made on the same golf course and can be made on the same nine holes played twice." Section 5c USGA HANDICAP SYSTEM manual. This works just like adding a regular score. See Score Box. Remember only nine hole courses can be selected as the course played. If you do not yet have the second nine to enter, click OK. HS will wait for the second nine to be entered before it can post the score. On the form that lists the golfer's scores you will see the text Waiting for second nine under the Combine Two Nines button. Once the second nine hole score is entered, the two nines hole scores are added together and posted as an 18 hole score. Ratings are added together to form an 18 hole rating, and an average slope is calculated. Note: You will notice the score is posted with a "C". This indicates that it was formed by combining two nine hole scores.